SVERT reported that on 3 April at 0755 ash from Grozny Group fell in Kurilsk (23 km N) and Kitovy, producing deposits 2-3 mm thick. Cloud cover prevented observations of the volcano. The next day satellite images showed an ash plume that rose 3 km (10,000 ft) a.s.l. and drifted W and NW. The Aviation Color Code remained at Yellow. Several minor eruptions occurred at Etorofu-Yakeyama (Ivan Grozny or Grozny Group) during 2012 and 2013. Our previous report 12/1992 (BGVN 17:12) described a 3 May 1989 eruption. The Japan Meteorological Agency (JMA), the Tokyo Volcano Ash Advisory Center (VAAC), and the Sakhalin Volcanic Eruption Response Team (SVERT) were primary sources for this report discussing events as late as April 2013 with no further notice of eruptions through July 2014. 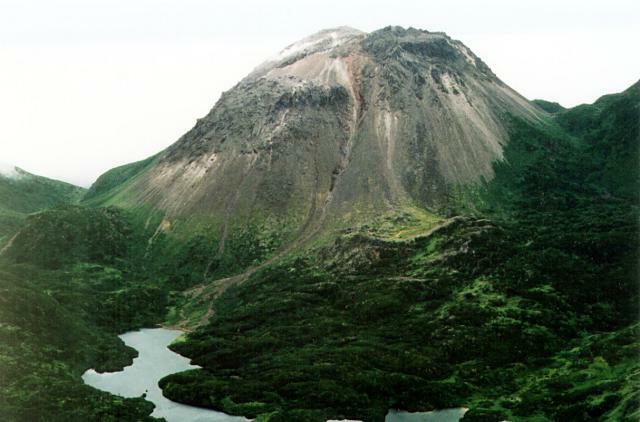 An andesitic lava dome forms the peak of Etorofu-Yakeyama. The Etorofu-Yakeyama complex also includes a ~3-3.5 km long caldera open to the S. The complex has erupted multiple times during 1968-1989. As seen in figures 4 and 5, Etorofu-Yakeyama rests on E-central Iturup Island (known as Etorofu-to, ??? in Japanese and Ostrov Iturup in Russian). According to Siebert and others (2010), nine other volcanoes reside on Iturup Island; the neighboring volcano, Sashiusudake [?? ?, Baransky], is located ~14 km NE. The island's extreme S end lies ~100 km NE of Shiretoko Peninsula on the island of Hokkaido, Japan. Figure 4. Etorofu-Yakeyama on Iturup Island and the regional area including Hokkaido, Japan (more than 200 km SW) and Sakhalin, Russia (more than 350 km NW). Three settlements on Iturup Island are noted here: Kuril'sk, Goyachiye Klyuchi, and Burevestnik. Green triangles indicate volcanic centers from the Global Volcanism Program's Volcanoes of the World database. Annotated GoogleMap image. Figure 5. Etorofu-Yakeyama located on a topographic map (100 m contour lines). Etorofu-Yakeyama sits ~6 km from the Pacific Ocean shore and ~14 km SW of the stratovolcano Sashiusudake (also known as Baransky). Map published by the Geospatial Information Authority of Japan and annotated with placenames from JMA reports. 2012 eruptions. According to SVERT, Etorofu-Yakeyama erupted on 16 August 2012, for the first time since 1989. The plume from the lava dome inside the caldera resulted in light ashfall in the Goryachiye and Kuril`sk settlements (to the N; figure 4). JMA reported the eruption started on 15 August and ended on 26 August 2012 as noted in table 1. Based on MTSAT-2 satellite images, JMA noted an ash plume reached 4 km altitude on 25 August. The Tokyo VAAC issued a Volcanic Ash Advisory (VAA) on 25 August. No additional ash observations were issued after 25 August 2012. Table 2. A synopsis of eruptions that took place at Etorofu-Yakeyama during 1968-2012. The designations in parentheses next to the Gregorian year denote the Japanese imperial calendar year. Taken from the JMA website. Year Phenomenon Activity, damage, etc. Explosion Small explosion at summit crater in early January. Series of strong explosions at summit crater on 16 May and formation of a large crater. On 16 August 2012, F. Greenberg, a Sakhalin Region Emergency Ministry representative, reported that gas emissions on the NE slope had increased on 14 August which suggested unrest. Hokkaido University researchers associated with JMA visited Etorofu-to Island and reported eruptive activity started on 15 August. Four eruptions occurred during 25-26 August. One plume rose 4-5 km. Figure 6 shows the volcano erupting on 25 August 2012. The next day in the same general area the researchers reported fumarolic activity on the NE side where the ash plume vented (figure 7). SVERT reported during 23 August-3 September increased fumarolic activity at Etorofu-Yakeyama. The Aviation Color code during that interval was Yellow. Figure 7. Etorofu-Yakeyama seen during an eruption as viewed from NW on 25 August 2012. Courtesy of JMA and Hokkaido University. Photo by M. Nakagawa. Figure 8. Etorofu-Yakeyama during fumarolic activity viewed from N on 26 August 2012. The double peaked topography to the left of the active dome is called Boshizan. Courtesy of JMA and Hokkaido University. Photo by M. Nakagawa. 2013 eruptions. Ash fall was reported several times during February-April 2013. SVERT reported that on 16 February, a gas and ash plume rose to an altitude of about 3 km. Tokyo VAAC reported a possible eruption occurred on 29 March. The possible ash plume rose to 2.1 km and drifted E.
On 3 April 2013 an eruption took place that was later reported by Interfax, Russia & FSU General News. 2-3 mm of ash was deposited on Kuril`sk and other settlements. Plume height was not recorded due to cloud cover in the area. On 4 April, the Tokyo VAAC detected an ash plume with an altitude of ~3 km drifting W and NW in satellite images. No additional ash observations were issued after 4 April 2013. Reference. Siebert, L, Simkin, T, and Kimberly, P, 2010, Volcanoes of the World, Univ of California Press, 551 pp. Information Contacts: Japan Meteorological Agency (JMA), Otemachi, 1-3-4, Chiyoda-ku Tokyo 100-8122, Japan (URL: http://www.jma.go.jp/); Tokyo Volcanic Ash Advisory Center (Tokyo VAAC) (URL: https://ds.data.jma.go.jp/svd/vaac/data/); Sakhalin Volcanic Eruption Response Team (SVERT) (URL: http://www.imgg.ru/en/svert.html); EMERCOM Crisis Management Centre (URL: http://en.mchs.ru/Forces_and_Facilities/National_Emergency_Management_Centre); Sakhalin Institute of Marine Geology and Geophysics Institute of Marine Geology and Geophysics FEB RAS (IMGG FEB RAS), 693022, Russia, Yuzhno-Sakhalinsk, Nauki str. 1B (URL: http://www.imgg.ru/); RIA Novosti (URL: http://en.rian.ru/); Itar-Tass (URL: http://tass.ru); and Interfax, Russia, & FSU General News (URL: http://connection.ebscohost.com). Based on analysis of satellite images, the Tokyo VAAC reported that on 30 March a possible eruption from Grozny Group may have produced a plume that rose 2.1 km (7,000 ft) a.s.l. and drifted E. A later VAAC notice stated that ash had dissipated. Based on visual observations, SVERT reported that on 16 February an ash-and-gas plume from Grozny Group rose 3 km a.s.l. The Aviation Color Code was raised to Yellow. Based on visual observations and analyses of satellite imagery, SVERT reported that during 10-17 September fumarolic activity at Grozny Group was at a medium intensity. The Aviation Color Code was lowered to Green. Based on visual observations and analyses of satellite imagery, SVERT reported that during 4-10 September fumarolic activity at Grozny Group increased. The Aviation Color Code remained at Yellow. Based on analyses of satellite imagery, SVERT reported that on 22 August a gas-and-ash plume rose 500 m above Grozny Group and drifted 15 km NE. Fumarolic activity increased during 23-25 August. Observers reported that an ash plume rose to 5 km (16,400 ft) a.s.l. on 25 August. That same day the Tokyo VAAC reported that a possible eruption from Etorofu-Yake-yama, a lava dome of the Grozny Group, may have produced a plume that rose to an altitude of 4 km (13,000 ft) a.s.l. and drifted E.
According to news reports, Ivan Grozny, one of two volcanoes comprising the Grozny Group, erupted on 16 August, after increased gas emissions from the NE flank were observed the day before. An ash plume rose 1.2 km and caused ashfall in Goryachiye Klyuchi (9 km W) and Kurilsk (25 km away). Residents reported a sulfur dioxide odor. By the afternoon ashfall had ceased and the odor subsided.
. . . at the beginning of the year there was a single weak explosion from the volcano "Ivan Grozny" on the island of Iturup. An abrupt increase in white fumarolic emissions, accompanied by weak explosions of gas and black ash, was observed . . . 3-4 May. A seismograph in Kurilsk (~30 km from the volcano) recorded weak earthquakes at various depths and short-period volcanic tremor for the following 5 days [see also 15:2]. On 8 May at 1330, a strong explosion ejected a black ash column that reached 1,500-1600 m above the summit within 8 minutes. By 1402, winds were dispersing the plume. A low-frequency rumble was heard in Kurilsk and Goryachie Kluchi (9 km W) during the eruption, but witnesses on the Pacific coast (6-8 km S) heard no sounds. On 11 May, images from a NOAA polar orbiting satellite at 1400 and Japan's GMS satellite at 1900 showed no volcanic plume. Small ash explosions occurred after 14 May, and as of 26 May, steam/gas emissions were continuing. More than a week before the eruption, a report in the 25 April Sovetskii Sakhalin newspaper warned that the residents of Goryachie Kluchi village would be at risk if an explosion should occur. Before the eruption, fumarolic activity was concentrated in the N block along a wide fracture that extended 250-300 m down the W slope from the summit. Geologists who flew over the volcano in a helicopter and airplane 10 days after the eruption (on 18 and 20 May) observed a narrow mudflow, ~20-30 m wide and 1 km long, on the E slope. Fumarolic activity was still visible in the upper portion of the N block fracture. Fumaroles were also observed in the saddle separating the blocks of the dome, near the E slope. Further Reference. Abdurakhmanov, A.I., Zlobin, T.K., Markhinin, E.K., and Tarakanov, R.Z., 1990, The Ivan Groznyi volcano eruption on the Iturup Island in 1989: Volcanology and Seismology, no. 4, p. 3-9 (in Russian); v. 12, p. 423-430 (in English). Information Contacts: G. Steinberg, V. Ostapenko, and R. Bulgakov, Yuzhno-Sakhalinsk; G. Bogoyavlenskaya and I. Menyailov, IV; T. Baldwin, NOAA/NESDIS. After an increase in fumarolic emissions and weak ash explosions in May, fumarolic activity remained vigorous. An eruption on 19 June at 2230, accompanied by 2-3 minutes of weak rumbling, sent ash and gas to ~2 km. An early August explosion formed new fumarolic vents on the dome's N flank, ~70-100 m from the summit (figure 1). Figure 1. September 1989 photograph by A. Samoluk, looking W at the new fumaroles formed by an August explosion on the dome's N side. On a 16 September ascent of the dome, geologists G. Steinberg and S Tkachenko observed vigorous gas emission from several sulfur-encrusted fissures, and deep narrow craters ~2-3 m in diameter. Two mud flows (4-6 m wide) that extended 1.5-2 km down the dome's N side had destroyed areas of thick vegetation (bushes and bamboo). One flow reached Lake Lopastnye (figure 2). No juvenile material was found in the flows. A small mudflow deposit on the S side of the dome, and another on the W (previously seen 18 and 20 May; reported as E slope in 14:5) were also observed. Figure 2. September 1989 photograph by A. Samoluk, looking S at two mudflows on the dome's N side. Lake Lopastnye is in the foreground. Information Contacts: G. Steinberg and R. Bulgakov, Yuzhno-Sakhalinsk. After the May 1989 activity, geologists performed aerial and field investigations at the request of local authorities. They forecast that vigorous fumarolic activity and rare weak explosions would continue through August, and this assessment was printed in the regional newspaper Suvorovsky Natisc on 15 June 1989, 4 days before the June eruption. Moderate fumarolic activity continued in June. Seismic activity in a 100-m-wide zone extending NE across the volcano had increased March-May 1989. According to R.Z. Tarakanov, the earthquakes were at 30 and 60 km depths. Aerial observations in August revealed a new group of fumaroles in the NNE part of the dome. During their 16 September ascent of the dome, Steinberg and Tkachenko measured gas temperatures of 100-104°C. Deep, narrow, craters had formed at the intersections of en-echelon fissures, and the surface around them was covered by andesitic ash (table 1). It is not yet known if the material was juvenile. Table 1. Chemical analyses of ash samples collected from fissures in Ivan Grozny's summit dome. Analytical values are volume percent of dry gas. Courtesy of G. Steinberg. Fumarolic activity was distributed along the summit crater fissure. Before the May explosions, emissions had been observed over the entire cross-section of the crater's fissure and on the E slope of the dome. No fumarolic activity was observed in August on the E outer slope of the dome, only from its uppermost W portion. The floor of the E part of the crater was covered with 30 cm of ash but exhibited no fumarolic activity. 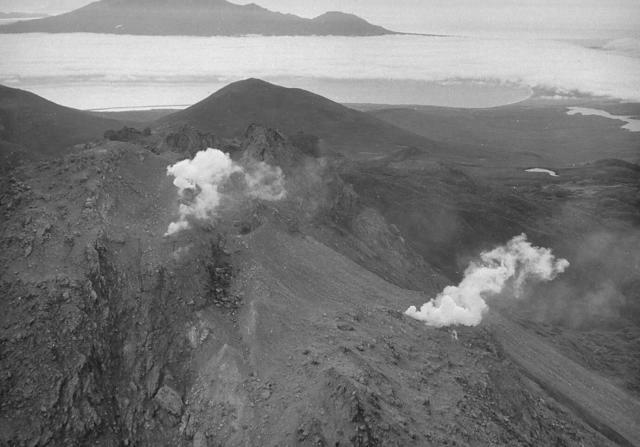 At the request of the local authorities, geologists forecast (and published in the local newspaper Krasny Mayak on 28 September) that the volcano's activity should continue at its present level through February 1990. The following description of the 1989 eruption includes information supplementing 14:5 and 14:12. The eruption began on 3 May, as gas emission became more intense in the trench at the central dome's summit and on the dome's NE flank. Ash rose to ~1.5 km above the summit on 8 May. Weaker ash eruptions took place 9-13 May, and lahars were triggered by intense snowmelt. The E lahar moved >600 m down the dome, spreading at its base to form a lithic-rich deposit ~200 m across. Other lahars, no wider than 3-5 m, flowed N toward Lake Lopastnoye (figure 3), destroying dense stands of bamboo; one lahar entered the lake. After the May eruption, gas emission was concentrated in the summit fissure, and gas was no longer emerging from fissures on the dome's NE flank. Figure 3. Sketch map of Ivan Grozny, showing 1990 gas-sampling sites. Courtesy of G. Steinberg. Small ash eruptions occurred again on 19 May and during the first 10 days of August. After the August activity, a new zone of fumaroles was observed on the NE part of the dome, 40-50 m below the fissure's N edge. Fissures 2-3 m wide and funnel-shaped vents 4-5 m in diameter that had ejected ash had formed on the NE part of the dome. S and Cl-rich water vapor was emitted vigorously from the new vents and fissures. Gas emission had nearly stopped from the E end of the summit fissure, where its floor was flat and covered with cooled ash. No juvenile material was found in the 1989 tephra. Etorofu-Yakeyama (Ivan Grozny), is located in the center of Iturup Island. It has a 3-3.5 km diameter caldera that is open to the south, where the large extrusive andesitic dome was emplaced. Several other lava domes of Holocene age were constructed to the NE; extrusion of these domes has constricted a former lake in the northern side of the caldera to an extremely sinuous shoreline. Historical eruptions, the first of which took place in 1968, have been restricted to Etorofu-Yakeyama. There is no Deformation History data available for Etorofu-Yakeyama [Grozny Group]. There is no Emissions History data available for Etorofu-Yakeyama [Grozny Group]. The Grozny volcano group in central Iturup Island contains the complex volcanoes of Ivan Grozny and Tebenkov. This September 1989 view from the east shows steaming fumaroles that were formed at the time of a minor 1989 eruption on the north flank of the large, 1158-m-high Grozny lava dome. Several other andesitic-dacitic lava domes of Holocene age were constructed to the NE of Grozny dome. Historical eruptions, the first of which took place in 1968, have been restricted to the Ivan Grozny lava-dome complex. Photo by A. Samoluk, 1989 (courtesy of Genrich Steinberg, Institute for Marine Geology and Geophysics, Yuzhno-Sakhalinsk). Grozny lava dome, seen here from the north with Lake Lopastnye at the lower left, is the largest dome of the Grozny volcanic complex. The two thin light-colored areas descending from the summit region in this September 1989 view mark the paths of small lahars from a minor eruption beginning in May 1989. The left-hand lahar reached the lake. The dark-colored area at the lower right is part of a series of lava flows that extend from beneath the dome's debris apron. The largest of these, on the south flank, reached 6 km to the sea. 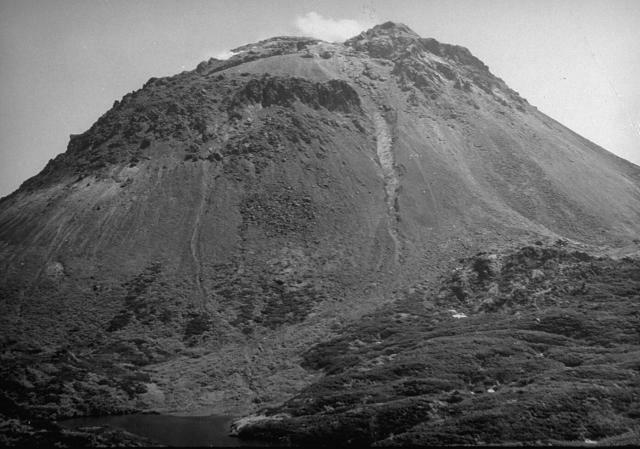 The steep-sided Ivan Grozny lava dome is seen from the north with lava flows descending into Lopasnoye lake in the foreground. The Grozny volcano group in central Iturup Island contains the complex volcanoes of Ivan Grozny and Tebenkov. The forested Tebenkov volcano lies immediately to the NE of the Grozny dome complex. Historical eruptions, the first of which took place in 1968, have been restricted to Ivan Grozny. Photo by A. Korablev, 1993 (Institute of Marine Geology and Geophysics, Yuzhno-Sakhalin). There are no samples for Etorofu-Yakeyama [Grozny Group] in the Smithsonian's NMNH Department of Mineral Sciences Rock and Ore collection. Large Eruptions of Etorofu-Yakeyama [Grozny Group] Information about large Quaternary eruptions (VEI >= 4) is cataloged in the Large Magnitude Explosive Volcanic Eruptions (LaMEVE) database of the Volcano Global Risk Identification and Analysis Project (VOGRIPA).